The St. Mary’s St. Vincent de Paul will be holding its 8th Annual Friends of the Poor Walk. The Walk, 1 ½ or 3 miles, is our only fund raiser. SVdP members offer help to all Franklin residents in their time of need. Your support enables us to provide this assistance. Last year we were able to help 186 families. Registration will begin between 8:30 AM and 11:00 AM in the Benjamin Franklin Charter School parking lot on Pleasant Street and then the walk will begin there at 9:00 AM rain or shine. Please walk with us in fellowship and contribute to our drive with generosity. 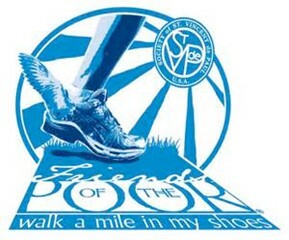 To make this Walk better than ever, go to www.fopwalk.org where you can either join the Walk or make a donation. to make our Walk better than ever!